MINUSCA and MINUSMA Representatives meet with Ex-Seleka Leaders (UN Photo/Catianne Tijerina). The signing of a ceasefire on 23 July between the CAR’s Seleka rebels and anti-Balaka fighters raised some hopes of a political solution after more than a year of violence. 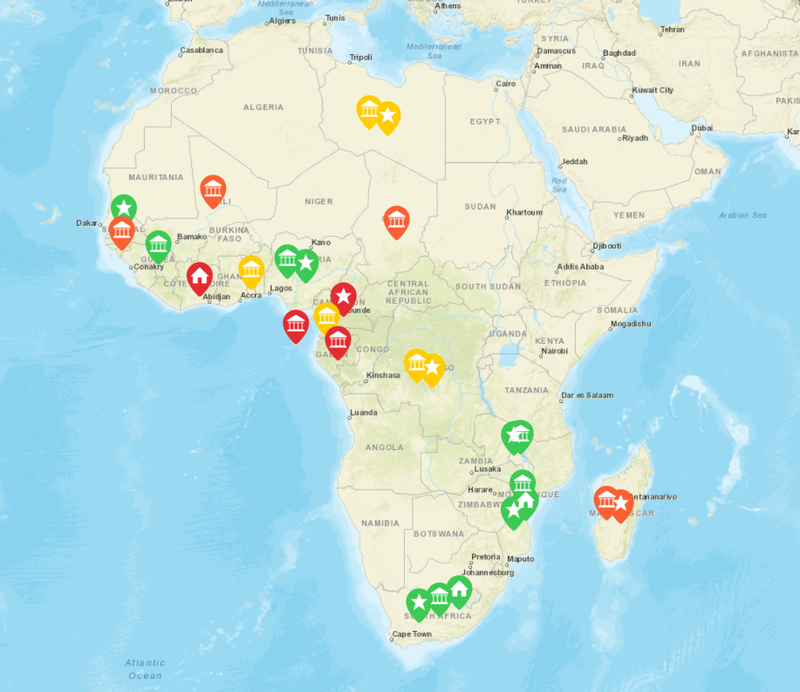 The talks, held in Brazzaville in the Republic of Congo, involved dozens of members of armed groups, about 170 Central African officials and civil society members. The ceasefire was welcomed by the international community and the African Union, who expressed hope that it would put an end to violence that has killed thousands and displaced more than 900,000 people – nearly a quarter of the country’s population. The agreement called for all parties to abstain from all forms of violence, including summary executions, torture, harassment, arson, looting, arbitrary detention and execution, the recruitment and use of child soldiers and sexual violence. The deal also saw the Seleka representatives drop their demand for the country to be partitioned along religious lines. The partition proposal, made by a few Seleka rebels, was never seriously considered by the CAR government or the international community both of whom have spoken out against it. The decision by Seleka to drop this demand after boycotting the Brazzaville meeting for two days was therefore viewed as a positive step. There were some important omissions in the ceasefire agreement; there were no provisions for the disarmament, demobilisation and reintegration of armed groups and no roadmap for the introduction of the ceasefire. In addition, representation in Brazzaville by armed groups was minimal. The signatories, Mohamed Moussa Dhaffane of the Seleka and anti-Balaka national coordinator Edouard Ngaissona, remain unable to control armed actors on the ground. Violence continues unabated barely a month after the Brazzaville ceasefire. At least 20,000 people have been displaced in Batangafo since July, and the latest figures from Bambari suggested some 17,000 people have been displaced due to violence since June. Both sides continue to blame the other for breaking the ceasefire agreement. Both towns – located in northern CAR – are more or less controlled by the Seleka, and have seen numerous clashes between the Seleka and anti-Balaka. Much of the violence in Batangafo took place after Seleka rebels refused the offer of disarmament and containment. Both peacekeepers from the African-led International Support Mission (MISCA) and French Sangaris forces have been involved in violence. In Bambari, at least 140 people were reported to have been killed in July despite the on-going peace discussions. Anti-Balaka denied responsibility, stating clear orders had been given to commanders before the Brazzaville deal to end attacks. However, anti-Balaka is also a myriad of associated groups, lacking centralised command and control, so it is unclear whether such orders would be adhered to by armed militias. As a sequel to the Brazzaville agreement, on 1 August, the Transitional Parliament or Transitional National Council (CNT) began an emergency one-week session on the implementation of the transition roadmap, including the enlargement of the CNT. There are several concerns about the formation of a new government. Amnesty International highlighted in its 10 July report “˜Central African Republic: Time for Accountability’ the problem of impunity. Amnesty has called on the transitional authorities to ensure that an enlarged CNT does not result in the appointment of cabinet ministers suspected of human-rights violations. The report identifies members and allies of the anti-Balaka and Seleka armed groups suspected of serious human-rights abuses and violations of international humanitarian law. The list included former President Michel Djotodia as well as anti-Balaka coordinators such as Levy Yakete and Patrice-Edouard Ngaissona, both of whom were already under UN sanctions for their alleged involvement in human-rights violations and abuses committed in the country. For all the real and potential spoilers, the Brazzaville deal did enable some progress. Following the ceasefire, the government of Prime Minister Andre Nzapayeke resigned to allow the formation of a more inclusive government. Interim President Catherine Samba-Panza appointed Mahamat Kamoun, a Muslim who previously worked with Michel Djotodia as well as former President Francois Bozize, as the new Prime Minister. He will announce his cabinet shortly; however his appointment was not met with overwhelming support from the Seleka or interested international players. Meanwhile, the government is discussing measures to improve security, agricultural production, the financial system, health and education, the country’s return to the Kimberley process (a global initiative to stem the trade in conflict diamonds), and efforts to allow refugees a safe return home. It is possible that the dynamics will become more favourable for peace as the long-awaited UN peacekeeping mission to CAR (MINUSCA) is deployed next month. The new UN mission will take over the responsibilities of MISCA and is expected to comprise of up to 10,000 military personnel, including 240 military observers and 200 staff officers, as well as 1,800 police personnel. The UN is currently “˜re-hatting’ some of the MISCA forces to join MINUSCA troops. The deployment of UN peacekeepers should help prevent further violence and encourage disarmament. Accompanied by reasonable expectations of the Brazzaville ceasefire deal as the first of many steps towards peace, there may be some light at the end of the tunnel. Thanks you very much for this article. I just noticed that there might be a mistake in the 4th paragraph. The Bambari faction is commended by Genenal Zoundeko, while the Birao one is led on the ground by Nourredine Adam, with Michel Djotodia as the official head of the Seleka following the Birao general assembly in July.